A tactical accessory for roleplaying games or boardgames. 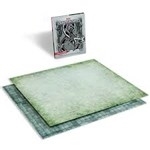 This sturdy double-sided, grid-lined play surface is ideal for when your gaming campaign gets tactical. One side features a stone floor good for dungeon and city encounters alike, while the other features terrain useable for a wide range of rural and wilderness encounters. Additionally, the Adventure Grid folds up for easy transport and storage, and can be used with both wet-erase and dry-erase pens interchangeably.